Perfect for one vacation rental or one hundred rentals. The Perfect Getaway. Welcome to our site for Vacations on Miami Beach on the Shelborne Resort and the Condominiums at Millionaires Rd in Miami Beach. Located in the heart of South Beach, (Miami Beach) and within walking distance to absolutely everything you want do. Different reservation page for each location. Multiple units listed for each location. These Hawaiian getaways are for the discerning traveler seeking good value. Steve and Tamara spent many years working in guest services at several top resorts such as the Four Seasons Wailea, Fairmont Kea Lani and the Grand Wailea Resort and Spa. They bring the attention to detail, customer service and high standards that these resorts demand to their own rentals, thus providing an alternative to the expensive five-star hotels with all the amenities and more. 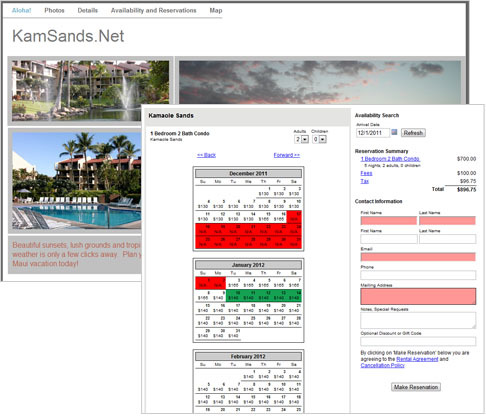 Each unit has its own single unit reservation page. Kamaole Sands is one of the most popular condominium resorts on Maui. Located on the second floor of building four, our vacation home is a spacious and comfortable one-bedroom, two bathroom condo. Kamaole Sands offers 15 acres of tropical gardens, complete with ponds, fountains, and waterfalls. 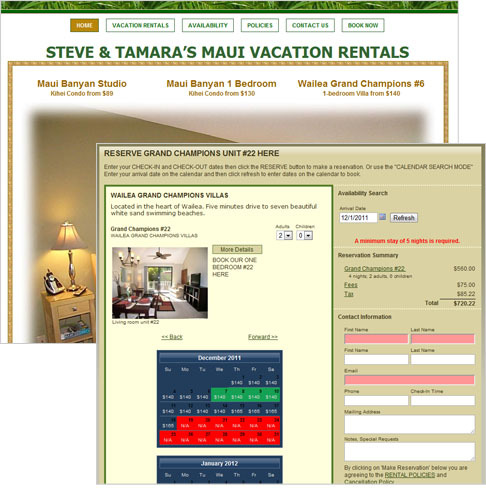 An example of the single unit reservation page. 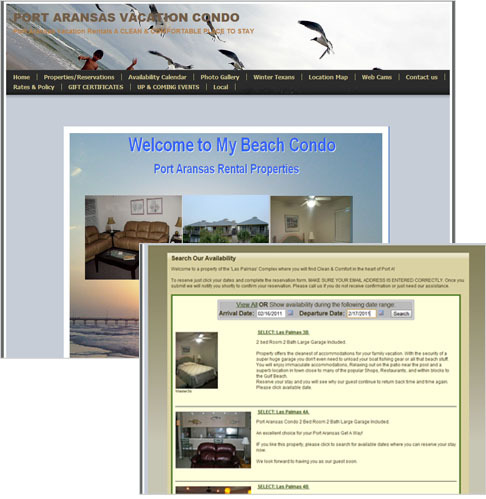 Welcome to a property of the 'Las Palmas' Complex where you will find Clean & Comfort in the heart of Port A! Utilizes a single unit search page. Clicking on the unit brings the guest to the single unit reservation page. "The system is robust. It's tight. It's very easy to manipulate it to do things MY way. It doesn't just work, it works very, very well."